The first trip to IKEA (and hopefully the only one for a long long time) is done, the boxes are unpacked and I no longer need a map to find my way to work and home again. It would be wrong to say I already feel at home in Rome but, slowly at least, Alessandro and I are finding a rhythm for this new life we are sharing in Rome. This weekend then involved our first trip to the market in Testaccio for our weekly foodshop (and my first, rather timid, conversation with the vegetable guy over what type of onion I should be using for a Soffritto – ‘le cipolle gialle’ (the yellow onions) it turns out), and, most importantly, to buy the various ingredients I needed for Sunday’s lunch. We had invited some friends over and I was keen to finally make use of the Tagine I bought in Safi on our trip to Morocco in September and as luck would have it, we got hold of the last lamb shoulder at the market. We feasted on a warm and comforting Tagine, slowly cooking the roughly chopped lamb shoulder with dried apricots, lots of onions and warming spices (the perfect dish now that the temperatures in Rome have started to drop as well) as well as a vegetable Couscous I made with carrots, potatoes, some pumpkin Alessandro’s mum gave us and zucchini, soaking up the juices from both the Tagine and the Couscous with little home-made honey and fennel flatbreads. Before peeling ourselves of the sofa for a much-needed afternoon stroll (that may or may not have involved some granita al caffe con panna from Tazza D’Oro just around the corner from the Pantheon), we sat around the big dining table, eating this year’s first batch of perfectly ripe clementines, dunking these Orange-Scented Almond Macaroons in our coffee and playing with Luca, our friends’ baby boy who has just learned to make the cutest screeching noises when you pull funny faces in front of him. Anything orange-scented is a winner in my book and luckily, this recipe could not be simpler. 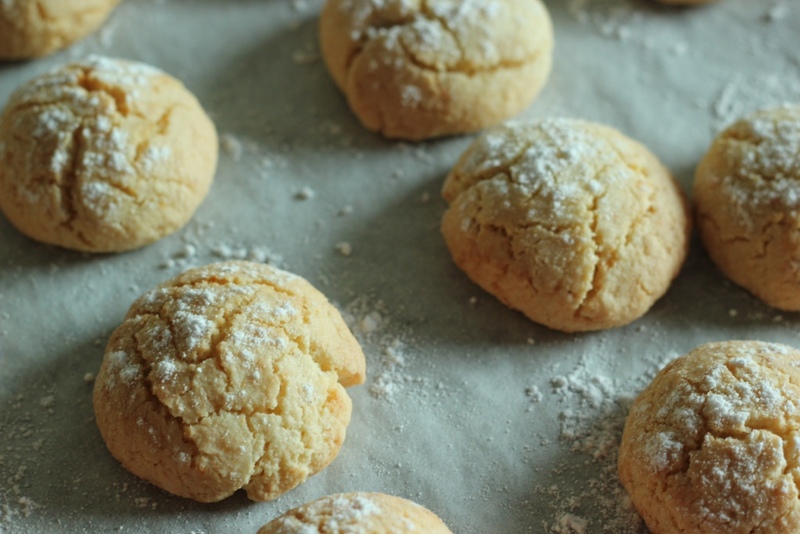 Also the list of ingredients is very short meaning you can whip these macaroons up in no time (and will hopefully already have everything you need to hand). 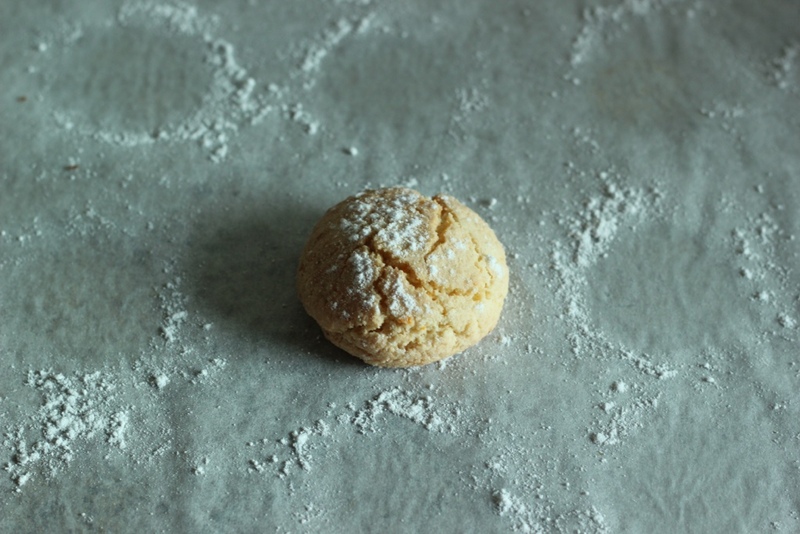 The only thing to be mindful of is to keep on oiling yours hands as you form the macaroons as the dough is very sticky. 2. In a bowl beat the egg until light and fluffy. 3. 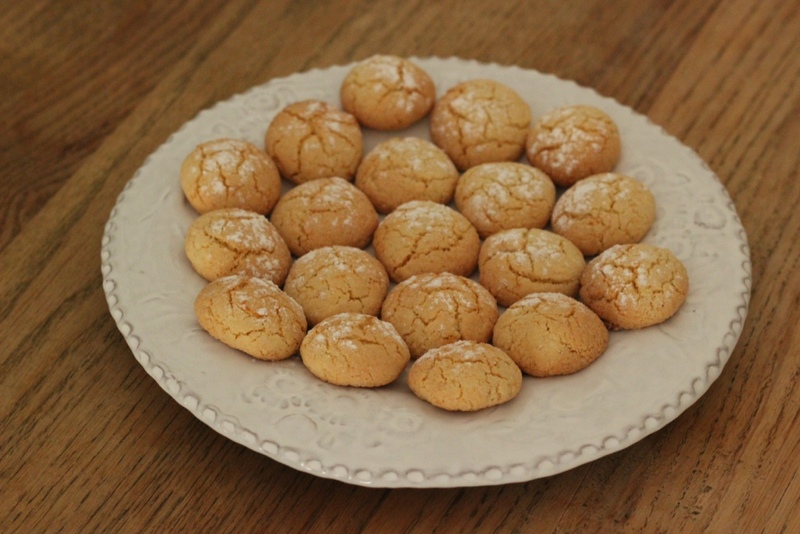 In a separate bowl combine the ground almonds, the flour, the powdered sugar, the caster sugar and the orange zest. 4. 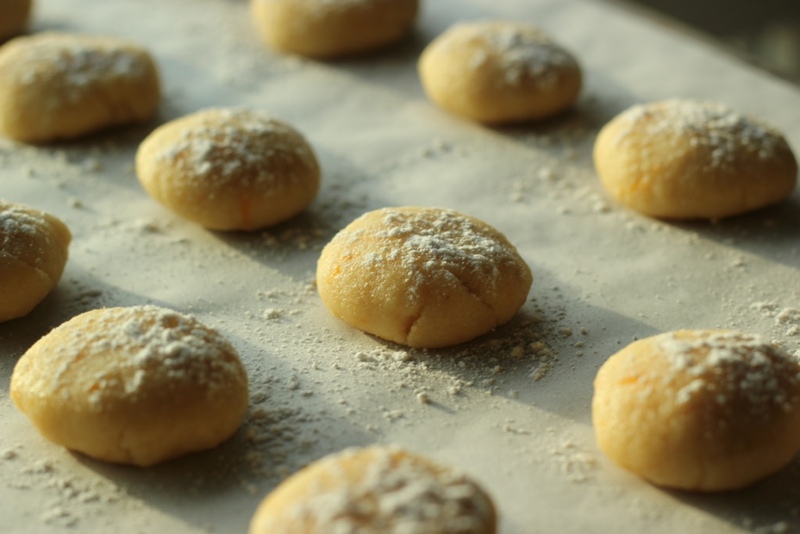 Combine the flour mix with the beaten egg and work the dough until it is smooth and elastic. Let the dough rest for 15 minutes under a tea towel. 5. Roll the dough into a a log, ca. 5 cm in thickness. Cut the log into 24 equal sized slices. 6. Oil your hands and roll each slice into a small ball, place each ball onto a parchment-lined baking sheet and flatten each ball with the palm of your hand. 7. Dust the balls with powdered sugar before placing in the oven for ca. 15-20 minutes until golden brown. 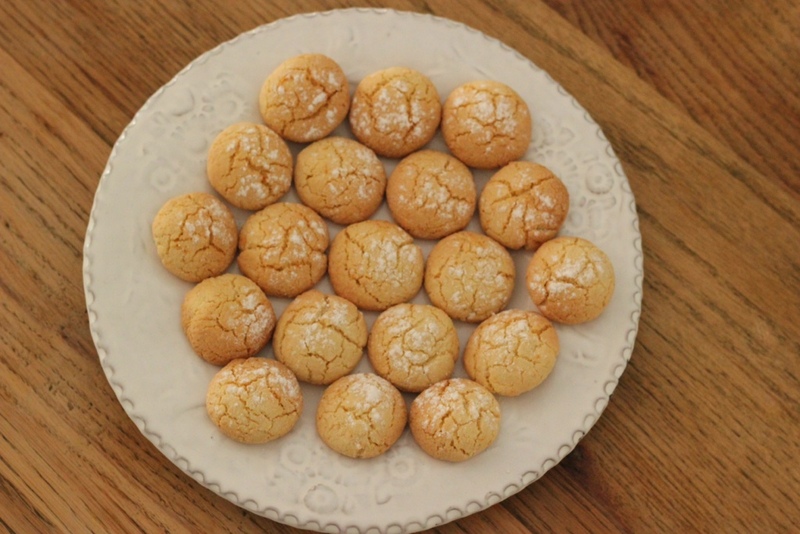 Traditionally these macaroons are made with lemon zest and cinnamon, but this version with orange zest works equally well. These types of macaroons are typically served after a long meal together with Orange Blossom Water flavoured fruit salad and a big pot of tooth-achingly sweet mint tea. Next time I might try and use the zest of 2 or 3 limes to see whether that would be a good alternative recipe (and we all know from drinking too many Mojitos that mint and lime go together rather well). I am also curious to try substituting the ground almonds with other ground nuts – I am sure walnuts could work well here or even roasted and ground peanuts, adding some chopped dried blueberries and making peanut butter and jelly macaroons.